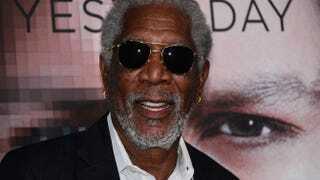 Morgan Freeman poses on arrival for the Los Angeles premiere of ‘Transcendence’ on April 10, 2014, in Los Angeles. A private jet carrying Oscar-winning actor Morgan Freeman on Saturday had to make a forced landing after the plane blew a tire on takeoff in Mississippi, according to NBC News. Freeman 78, and the pilot were the only ones aboard the plane, and were uninjured in the accident that occurred upon takeoff from Clarksdale, Miss. The plane landed a short distance away at Tunica Airport, about 40 miles southwest of Memphis, Tenn. The actor was en route to Houston to shoot a segment for the series The Story of God, Freeman said in a statement distributed by his publicist, Stan Rosenfield. Freeman won an Oscar in 2005 for his performance in Million Dollar Baby. He has also won acclaim for his performances in The Shawshank Redemption and Invictus.